Fracture walking boot is one of the worst treatments for an injured runner. Today we are talking about the fracture walking boot which is one of the worst treatments possible for an injured runner. Now, I’m sure that virtually everybody reading to this has seen someone in a fracture walking boot. Basically it’s a big Velcro boot that functions as a cast that you can actually remove. And this probably sounds like a great idea because as the name implies it is supposed to allow you to walk when you have a fracture. Fracture walking boots are often prescribed as a treatment for running injuries…a whole bunch of serious injuries actually, not just fractures. But runners have a much higher price to pay for immobilization. That is part of the reason that it makes fracture walking boots such a terrible treatment for runners. To begin, I am going to tell you a short story that will help drive home the point of how bad this can be. Ashley was a young athletic patient in her late 20s who developed a case of sesamoiditis. She was running daily and her foot started bothering her. She developed a stress fracture in one of her sesamoid bones. The sesamoids are are the little bones underneath the big toe joint. Although they are small bones it can be a really serious problem and it has to be treated aggressively. Since she didn’t quickly respond to some simple treatments she had to be placed in a fracture walking boot. But unfortunately she was on her feet all day for her job. She also walked from Telegraph Hill to downtown San Francisco and back every day to and from work. Although she was protected and immobilized in the fracture walking boot she was still on her foot all day. Because she was on it so much, it actually took eight weeks for the foot to heal. But the problem with this is that she was stiff and weak and uncoordinated after all that time in the boot. In addition, she actually had some decrease in the bone density of the other bones in her foot just from being in the fracture walking boot for two months. Knowing that she would be at high risk of re-injury, I made some custom orthotics for her to take the pressure off of the sesamoid bones and support her foot as much as possible. I fitted her for the custom orthotics and we talked about how to break them in. So when Ashley went for that short run, on flat ground, even at a really slow pace, she actually broke her fourth metatarsal bone. All because her bones were weaker and she was stiffer and uncoordinated from all that time that she spent in a fracture walking boot. After two months of incarceration in the fracture walking boot, she had to actually go back into the fracture walking boot for another six weeks to get the metatarsal fracture to heal. The problem with fracture walking boots isn’t that it’s a terrible treatment by itself, it’s just that it’s a terrible treatment for runners. When I had a standard practice with a broad mix of patients including both athletes, sedentary patients and elderly patients, I put patients in fracture walking boots almost every day. Now it’s a pretty rare thing because I only see athletes. And I truly believe that a fracture walking boot is almost as bad as surgery when it comes to treating a runner. 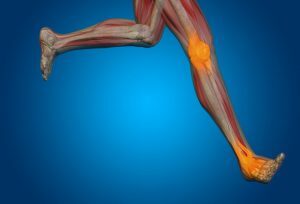 The reason it’s so terrible is that runner’s get four different problems that actually happen just from being in the boot. I think it is important that you understand each of these. So let’s talk about each of these in a little bit more detail. We will also discuss some of the research that has been published in medical journals to help you understand how important it is to try to avoid using a fracture walking boot if at all possible. A study published in the Scandinavian Journal of Rehabilitation Medicine showed that there was a 28% reduction in ankle dorsiflexion strength after 6 weeks of immobilization. Believe it or not, even short-term immobilization can have a profound effect on the amount of strength you have (or do not have). A study in 2015 reported that there was a 23 to 28% reduction in leg contraction strength after only 2 weeks of immobilizing the leg in a brace while using crutches. Perhaps even more importantly that study show that after six weeks of aerobic retraining there was an increase in strength but not full rebuilding of the muscle strength that had been lost due to the immobilization during that two-week period. Another study showed that there was anywhere from 3 1/2 to 8% decrease in lean leg muscle mass after only five days of wearing a cast on the leg. 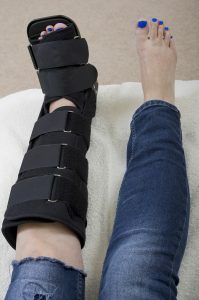 Of course, many times when you are told to use a fracture walking boot the doctor will recommend crutches or some other form of non-weight bearing like a knee-walker a roll-a-bout or a wheelchair. This is not good for athletes. A study published way back in 1992 showed that after six weeks of using crutches to keep the foot non-weight bearing there was an 17% decrease in muscle strength. So if you’re using a fracture walking boot and crutches to keep the foot off of the ground, there’s a more significant and more rapid loss of muscle strength. On top of all of this if you happen to be a female athlete things are even worse for you. A study in the Journal of Applied Physiology showed that immobilization induced loss of muscle strength is greater in women when compared with men after 14 days of immobilization. We know that bone density can decrease anytime a foot or leg is immobilized and particularly if it is suspended in the air when using crutches. But what many people don’t realize is that there have been studies that actually show that after a period of disuse you get decreased bone density that may never come back. There was one study that evaluated the bone mineral density in the lower leg after hip fractures. Researchers found that there is a significant reduction in bone mass remaining one year after the fracture. Even after five years there had been some return and some improvement in the mineral in the bone density but it still had not improved back to baseline. It still wasn’t normal after five years! 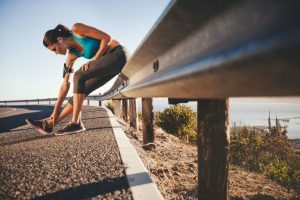 The obvious concern is that having decreased bone density after you have recovered from an injury and started training again can put you at higher risk of a fracture in the future. Most people wouldn’t really think that there is a big problem with the mobilizing the foot or ankle at all for short period of time. But one study showed that with only one week of immobilization of the ankle there is loss of strength and balance. From that study the authors concluded that the reduction in strength and balance was mainly a result of neural imbalances or decreased nerve function. When you wear a fracture walking boot, you start to get scar tissue forming around all of the structures made of collagen. Everything that you have in terms of a tendon, a ligament, a joint capsule, all of those things that hold the bones together and help connect the muscles to the bones, they’re all made of collagen. When you lock up your foot and ankle in a fracture walking boot, you start to get scar tissue forming because nothing is moving. This happens pretty quickly and it really can become incredibly stiff. Six weeks is a commonly prescribed time frame for athletes who suffer a stress fracture or severe tendinitis issue and have been placed in a fracture walking boot. But six weeks is not right for everyone. Locking up the foot and in mobilizing it in a fracture walking boot is a terrible thing for an athlete. After only four weeks of immobilization you can have anywhere from a 20% to 60% reduction in muscle diameter. 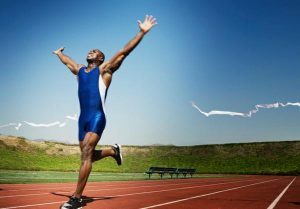 All of that weakness and loss and muscle strength put you at higher risk of re-injury because the muscles dynamically absorb force when you land while you’re running. If the muscles are weaker then the bones and tendons and ligaments have to absorb all of that force that isn’t being absorbed by the weak muscles. When you start running again you have to deal with all of the problems that occur as a consequence of being immobilized in a fracture walking boot. Now, just to be clear these four problems that we’ve talked about happen all patients after they’ve been immobilized in a fracture walking boot. However, you as a runner have a much higher price to pay because you fully expect and plan to be active after you get out the boot. You do intend to run again, don’t you? The truth is when I had a standard private practice with a standard group of patients, I used to put people in fracture walking boots almost every day. But during that time I had a standard mix of patients that included some athletes, some average sedentary Americans and some barely-active elderly people, too. If you take a patient whose idea of activity is playing bingo and you immobilize them in a boot and then they develop some weakness how would they ever know? If you take an average American who watches television on the weekend and really doesn’t do that much activity in terms of exercise they also don’t really notice if they have a little bit of stiffness or weakness in the foot. And because their overall level of activity is so much lower than any runner, they really aren’t at that much higher risk of getting injured again when they get back to activity. What they consider to be full activity would be considered rest for a runner. They’re not applying enough stress to really put themselves at risk. But not true for runners. You have to have higher standards for your own medical care and you have to find a doctor that supports your idea of activity and your pursuit of running. The stakes are just higher for you. The big take-home message here is to make sure that you discuss your athletic goals, your running routine and your long-term running goals with your doctor. Make sure that your doctor understands you need to recover as quickly as possible so that you can return to running as strong as possible. If you and your doctor work together, you can develop some creative ways to heal any injury and make the most of your recovery. If you do that, you can return and get back to running being strong and fast as ever.